My name is Nate. And I keep county lists. I realize that this admission tars me as the most obsessive and compulsive among a community of obsessive-compulsives. I realize that listing is a reviled in birding culture as it is celebrated, and more listing even more so, but hear me out here. I mean to make the argument that county listing is birding at its most pure, the ultimate combination of the two warring angels that sit upon each one of our shoulders. The first, the much caricatured hard-nosed lister who stops at nothing to get just one more bird, and the second, the deep-patch birder who just wants to hang around the common species. Both of these opposite ends of the birder spectrum combine effortlessly in the county birder. The search for the next new bird is that much more fulfilling when you’re limited to the smallest of the arbitrary political boundaries in the United States, and the search for those birds necessitates a broad working knowledge of the county of the sort that can only be attained through experience. Plus, your search for county birds can be as energy intensive or green as you want it to be. You simply cannot go wrong. I never had the time or the money to be a player on the ABA-area scene, and while I occasionally can be convinced to partake in a little state twitching, these days my birding is mostly with my county lists in mind. With a full-time job and a toddler at home, I find that paying attention to counties offers the opportunity to fill that competitive jones that so many birders feel without running deficits in time and money that would see me pushing the boundaries of my family’s patience. My latest, and ongoing, project, akin in some ways to a Big Year, is the Carolina Century Project, in which I try to accumulate at least 100 species in as many of North and South Carolina’s combined 146 counties as I can. This has been a challenging, but immensely fun, endeavor. 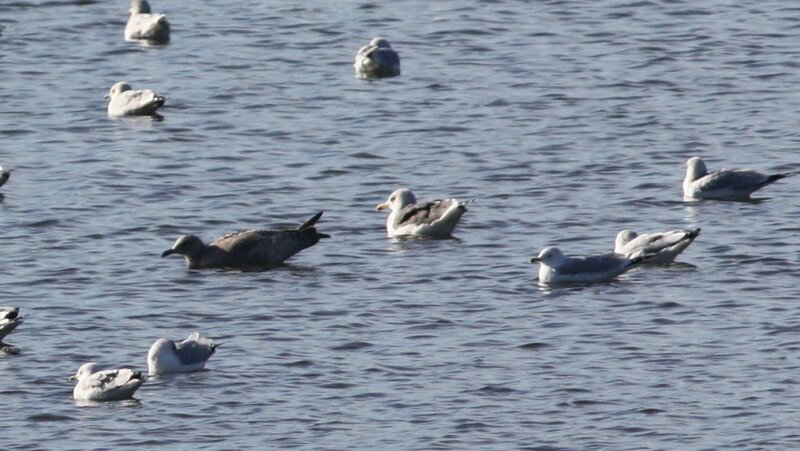 Take, for instance, the Lesser Black-backed Gull I happened upon on the recent Jordan Lake Christmas Bird Count. It’s a bird that’s not particularly notable in the state, occurring in large numbers along the Outer Banks, but here? 500 miles inland? A fine bird for the county. More than that, focusing on counties encourages you to get off the beaten track and away from the well-known hotspots. You peruse Google Earth looking for accessible reservoirs and patches of gameland that look productive. You spend time looking for something different, passerines on the coast, shorebirds in the rural piedmont, holes in those lists – sometimes common species – that need filling. You find yourself doing odd things like pulling over on the highway to scope for Ring-necked Ducks and grebes in multiple counties or pulling into McDonald’s parking lots looking for House Sparrows in small rural towns (surprisingly difficult!). Sure it sounds obsessive, maybe it is, but knowing where birds are on a fine scale is a huge part of becoming a better birder. I still chase state rarities, at least those within my self-imposed rarity radius, but so much of the fun any more is spending a little time around those stakeouts picking up incidental species and knowing that they count every bit as much as the target. 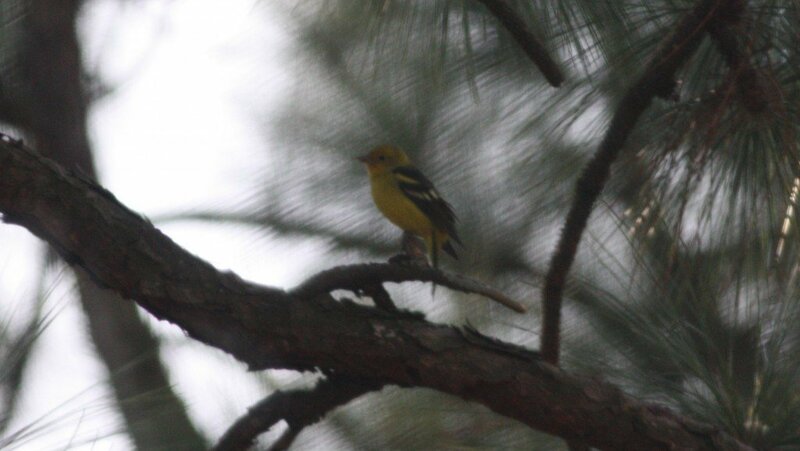 Case in point, this past weekend I headed south to the sandhills to find a Western Tanager that had been visiting a feeder in Moore County. State tick! But more importantly, county tick! The tanager was great, a stunning adult male, and North Carolina bird #325 for me, but just as good were the House Finches and Yellow-rumped Warblers that were surprising county birds. And isn’t that argument against the big listers? That regular common species are ignored? Not worth consideration? County listing turns the listing paradigm on its head. Suddenly every species and every trip is an opportunity, and that’s not something you can say about every time you go outside. I’m also a county lister, though I focus my listing interests mainly on my home county. It gives me a little extra motivation to go out and bird even on days when a trip to a more distant hotspot isn’t possible. And since I’m out birding places that few other people do, I get to find my own rarities (well, rare in terms of the county). County listing in the western United States is a bit different than county birding in the eastern United States. Counties out west are sometimes geographically as big as entire eastern states. But other than county size, the fun of keeping track of county birds is probably the same. What kind of crazy person obsessively keeps a county list? I’m a California County lister. There is a website just for all of us with fairly up-to-date maps showing where we are in every county. It is a lot of fun. Some of our counties are freaking huge though. San Bernadino is larger than any of the 9 smallest states and larger than the 4 smallest combined. We have our own “garden list” and the “Broome list” is officially 70km radius around the Broome Bird Observatory and has been for many years as it includes three ephemeral lakes. Using eBird kind of makes you a county lister by default. Whether you want to or not, it keeps a nifty county tally for you. I have fun watching the counties overtake each other depending on time of year and where I’ve been active. My patch list and my county list are the only lists I work at. I don’t have the means or the time to travel for birding, so I bird where I can. Even my county listing is done primarily in the northern end of my home county. I hope that after I retire (or win the lottery) that I can work my home state list for a year or two just for the fun of it. In the meantime, I have the county to play in. Since I am an eBirder, I became a County Lister by default. and, like you, I count every bird I see, where it is a House sparrow, a pigeon, or a snowy owl! I have no desire to be part of the Big year type listers, but I do a big January every year with a few other bloggers just for fun. since I do eBird, I look for counties that are under-birded and if I can get to them, I try to count birds there. I currently live in Essex count, MA, which is well covered by birders and eBirders, but I travel regularly to central Maine and go to Androscoggin county and Franklin county whenever I can, because these counties are notoriously under birded. I admire your tenacity and diligence. as a fellow obsessive lister, I totally understand! Keep up the good work! I’ve been eBirding for just over two years, and birding for not much longer, and I find that with small kids and both parents working, it is hard to travel. I live in eastern Massachusetts, which is heavily birded, and in Middlesex County, which has a lot of birders, it would seem. My county list is approaching 200, and working on it is exciting for all the reasons Nate gives. But even better is a town list that aggregates all the patches I frequent, and I’m lucky to live near several wildlife refuges, a large rookery, several rivers and large ponds, and ample farmland, all within town limits. I actually took it a little bit further. I live in Ontario, so the counties lines are harder to establish. You kinda have to put a dot on the ebird map and then check back to see what county it is. However I found since I live dead centre of my county and getting into the other ones takes some driving that I now try to fill in the gaps of my county list on a weekly basis. For example if I have a Ring-necked Duck the 2nd week of March but not the 3rd, I will go out to find a ring-necked duck the 3rd week of March. this is so that I accurately record how long these birds stay in my area. After a couple of years, it also tells me the frequency for even the common birds, like cardinals and house sparrows. As a follow-up to my comment above, I should mention that most California County birders are purists, too: we only count non-introduced birds on our lists! @John- Yes! Finding your own rarities is a great thing, assuming you don’t live in a heavily birded area like I do. I guess then, finding rarities are an even bigger deal. @Robert- You’re right, of course. I think that’s part of the reason county listing got its start in places like California and Texas. But thanks to eBird, now everyone’s a county lister. @Vermfly- Yes, that page is amazing. Many props to whoever has the time and inclination to keep it up. California county listers are serious. @Clare- We are pretty lucky in the US with our well-established small governmental boundaries, but it’s roughly the same as an extended patch list elsewhere. @Kirby- YES! I would be remiss if I didn’t mention eBird as both the facilitator and enabler of this new obsession. Without it, I don’t know that I’d do this. But with it, it’s amazing how much fun it is. @Carolyn- Absolutely. Competitive birding, even if it’s just with yourself, is just plain fun. It’s fun to find new things and work your area deeply and build that list. And it’s so easy too! @Kathiesbirds- I do the same thing. My NC counties are my primary focus, but I get a similar sense of accomplishment by getting out of the state and getting some data for undercovered areas. eBird makes that a blast. @David – I’m in the exact same boat as you re: small children. I almost envy your recent entrance into birding though. I have county lists, even NC county lists, that would be so much higher if I’d only kept then the kind of notes and lists I keep now. In some way I have to start from scratch, but even that is sort of fun, even if it bugs me that I know my total ticks should be much higher! @Matt- I have perused John’s page with much envy. I’m sort of a data and chart geek anyway, pair it with birding like John has done and it’s a serious time sink, even for someone with no immediate listing interest in California.